Footage taken at West Midlands Safari Park, Bewdley, Worcs, shows the creature poking its head into the passenger window of the vehicle. The woman in the seat appears to be holding some food which the giraffe, named Strider, clearly wants so begins tucking in. Her partner decides to wind up the window, in an attempt to force the animal away. But it proves to be a very bad decision. 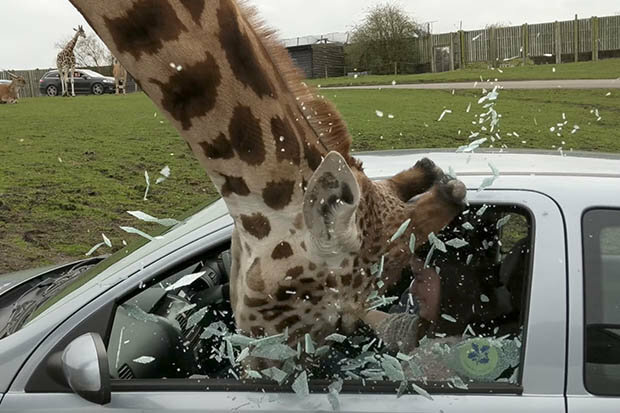 The giraffe becomes trapped inside the car and when it pulls its head out, the whole window shatters. Both the people watching in the vehicle beside and the passengers scream in horror. West Midlands Safari Park said the giraffe didn’t sustain any injuries but an investigation has been launched. YouTube user MoMedia, who filmed the clip and posted it online on Sunday, added: “I would like to point out that the couple did not intentionally do this, the young chap went into panic mode and didn't think straight about what he was doing. He was just trying to help his girlfriend. “I would also like to point out that the zoo keeper drove over and used food as bait to check on the giraffe.